Henniker, NH – Pats Peak ski area in southern New Hampshire is holding its annual Pond Skim Contest this Saturday, starting at 1 p.m. on the resort’s Gusty slope. 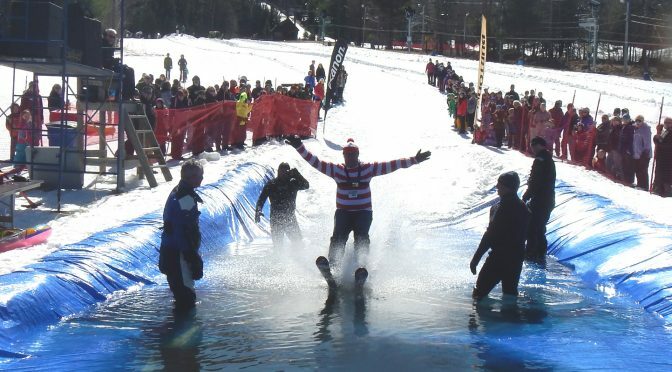 Participants ski or snowboard across a man-made pond or take the icy plunge. Registration is from 8:30 a.m. to 11:30 a.m.. Entry is free but the purchase of at least a Bluster Area Lift Ticket (or Pats Peak Season Pass) and a costume is required to enter the contest. Prizes will be awarded for Best Costume, Best Splash and Best Skim. “This is a fun event for participants and spectators. All participants must be dressed in a costume and try to make it across the pond. We’ve had some great costumes over the years. The spectators applaud when they make it across the pond and also enjoy watching them make a big splash,” says Jim Wall, Events Director at Pats Peak.